Last night's Blue Moon (the second full moon for the month of July) rises over Lake Superior in Grand Portage, MN. "Golden Sunrise over the Susie Islands"
Happy SUNday! A glorious sunrise that I captured with my Tamron 150-600 lens a few mornings ago. Looking across Wauswaugoning Bay at the Susie Islands and Pigeon Point, the northeastern-most tip of Minnesota. 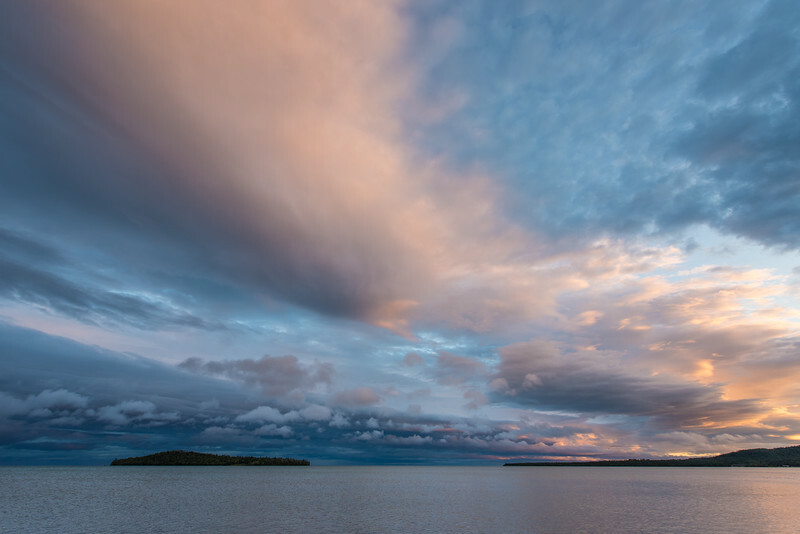 The other night while waiting for the moon to rise I watched this awesome cloud slowly work its way from shore out over Isle Royale National Park, which is faintly visible beneath the cloud. Lucille Island of the Susie Islands in Grand Portage is on the left side of the photo. I saw a few lightning flashes within this cloud but wasn't able to capture any of them in the photos that I made. It sure made for a nice scene to watch while waiting for the moonrise! 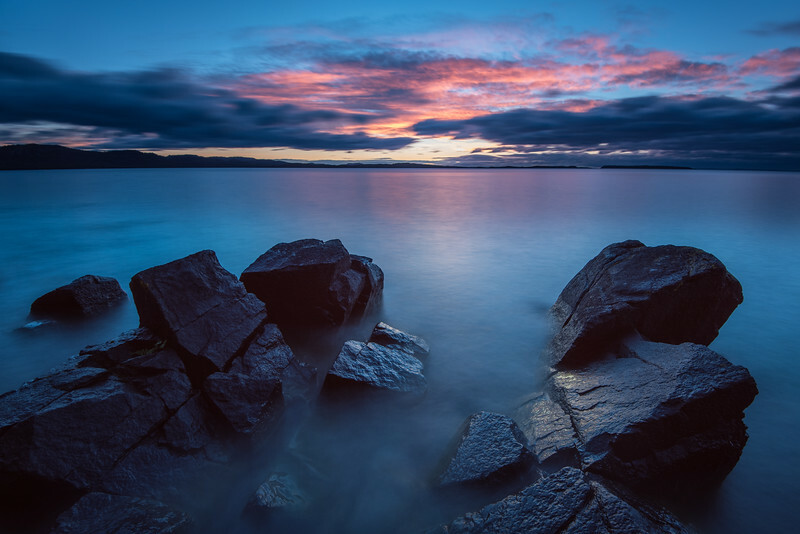 A summer sunrise over ancient rocks on the Wauswaugoning Bay shoreline of Lake Superior. I really love how this photo turned out. When I look at it it's easy to imagine this scene being millions of years ago. I love it when a photo looks like it could have been taken in a different time than that which we know today. Such photos make my imagination run wild and to me those are the best kind of photos. I used a 6-stop ND filter on this photo to lengthen the exposure time to 20 seconds which really softened the movement of the water and helped contribute to the timeless mood of the scene. 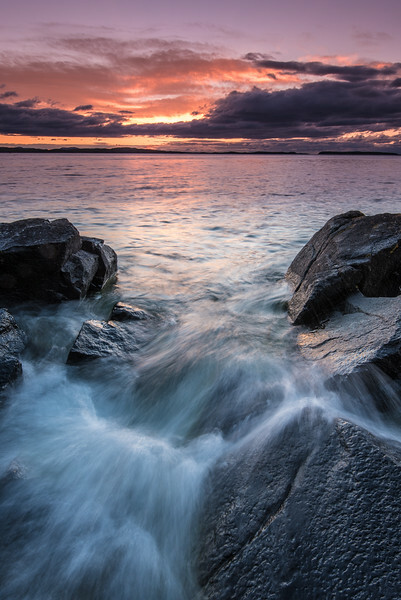 A recent sunrise over Wauswaugoning Bay on Lake Superior. I love rocks like the ones shows in this photo. Finding and photographing them with dramatic light at sunrise or sunset is always a treat. 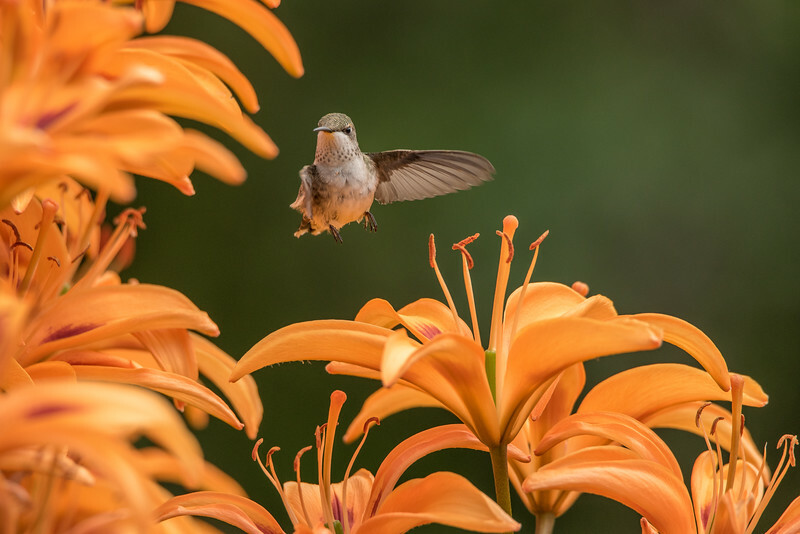 I've been having a ton of fun yesterday and again this morning photographing the hummingbirds in our lily garden in front of the house. About a week or so ago Jessica noticed that there was a pair of hummingbirds hanging around in random places around our yard. We noticed them feeding from the lily garden now and then, but they didn't really hang around in it a lot until yesterday. I was watering our raised garden beds yesterday morning and I noticed this pair of hummingbirds zipping around in between the beds. They even landed on the ground a few times. Then as I was watering the lily bed they were all over in it, sipping nectar from all of the flowers. They would work their way around the bed, then disappear for a few minutes and come back to work the bed over again. They did this for most of the day and have been doing it again today. It's tricky getting a good shot of them as they generally don't sit still for more than a brief moment. Every now and then, though, they would actually land on one of the petals and stay there for just a second longer than usual. That is when I made this shot. They are such fascinating little birds and it sure has been fun seeing them enjoy our flower garden! 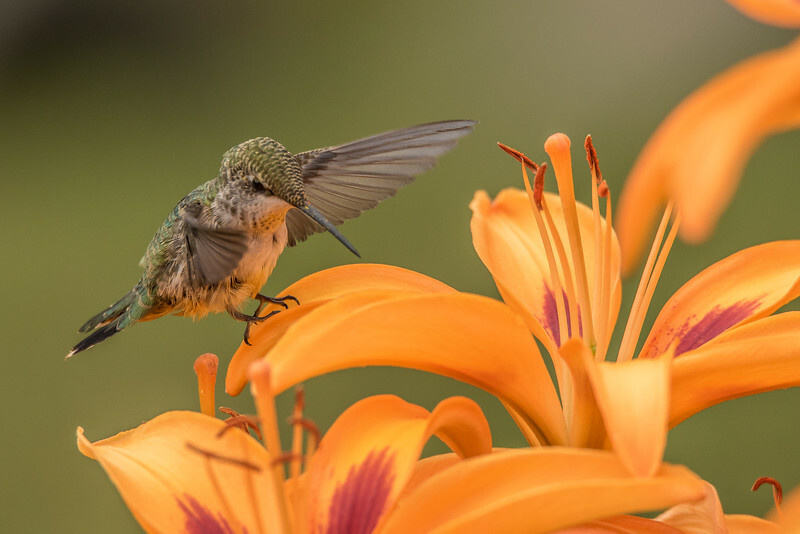 "Hummingbird in the Lily Garden"
Here is another batch of photos from the hummingbirds that have been frequenting our flower gardens. I cannot say enough how much fun it is to watch and photograph these birds as they roam around the flowers. Definitely one of the most fun situations that I've photographed in quite some time! 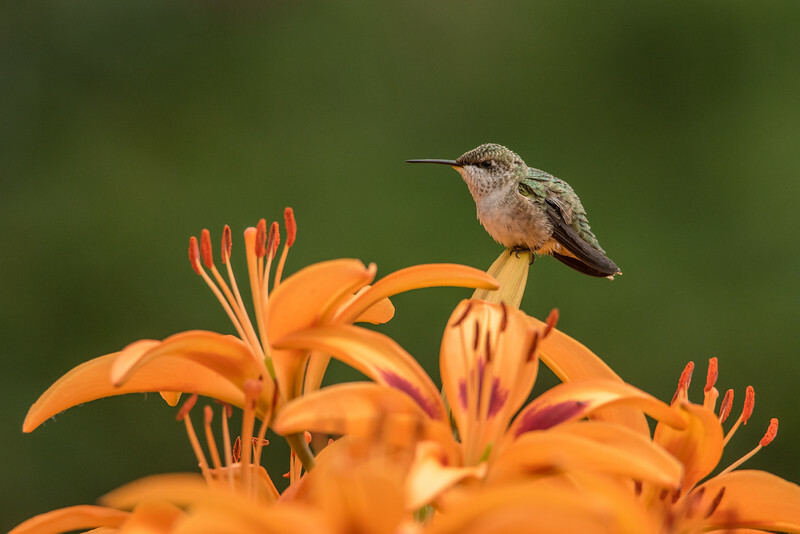 I've noticed them perching in various areas around the yard in between their feedings on the lilies. 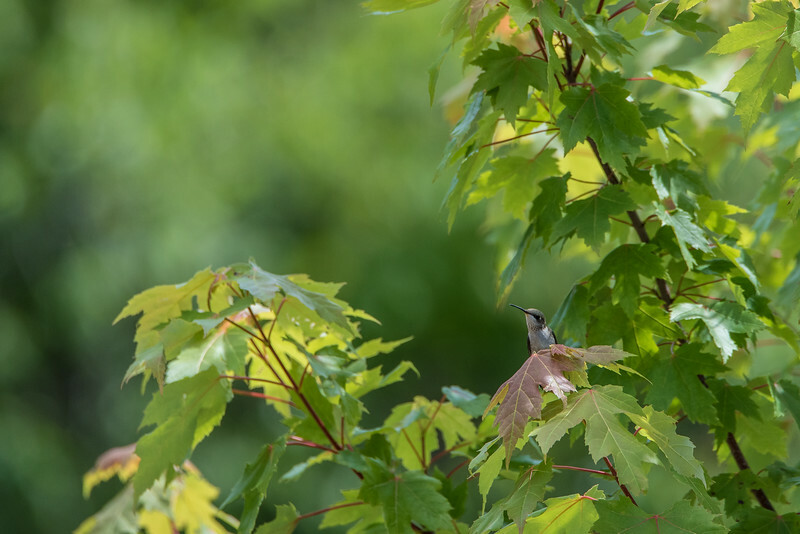 One of their favorite perches is on the young maple that we planted last year. 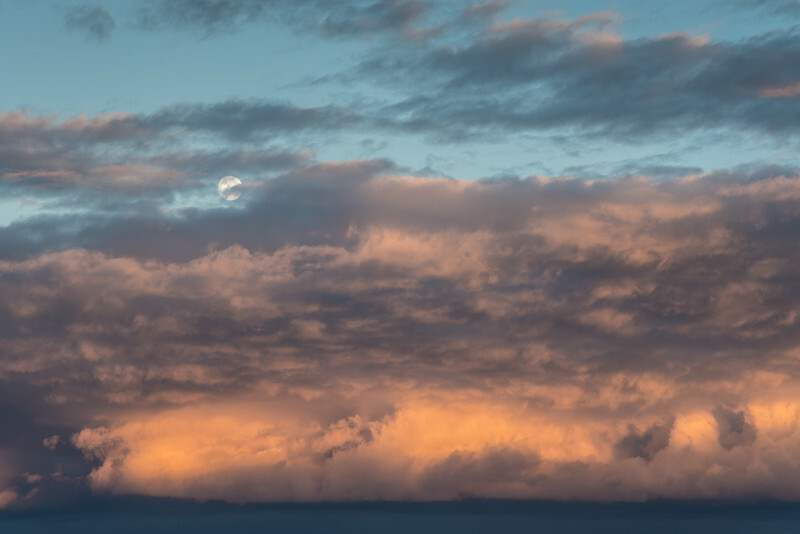 "Rising Moon and Clearing Storm"
A shot that I've been saving from the full moon a week ago. On the evening of July 29th we had some really cool cloud structure on the eastern horizon and those clouds lit up with some intensity when the sun was setting. It was a beautiful scene indeed when the moon started to show itself above those clouds! 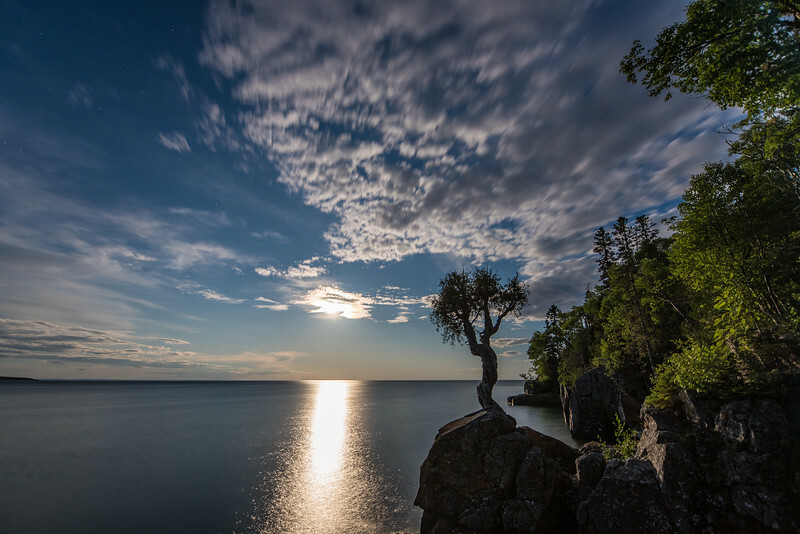 "The Blue Moon shines on Wauswaugoning Bay"
It's that time of year again for Grand Portage's annual Rendezvous Days celebration, which is our big pow-wow event each year that coincides with the rendezvous reenactment at Grand Portage National Monument. Both the pow-wow and the rendezvous are places you'll want to spend serious amounts of time as there is a lot to see and do. But, while you're here, you should also take some time to appreciate the scenic beauty that surrounds our area. 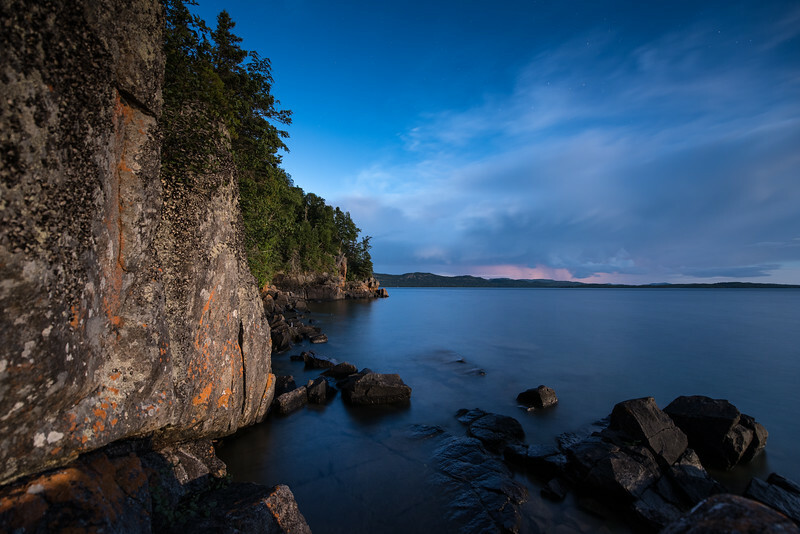 Grand Portage has some of the best views of Lake Superior to be found anywhere along the Minnesota shoreline of the lake. Here is one such scene taken at dusk during the last full moon, also called the blue moon since it was the second full moon to occur in July. The illumination that you see on the shoreline in this photo was from the light of the blue moon, which was rising behind me as I made this photo. 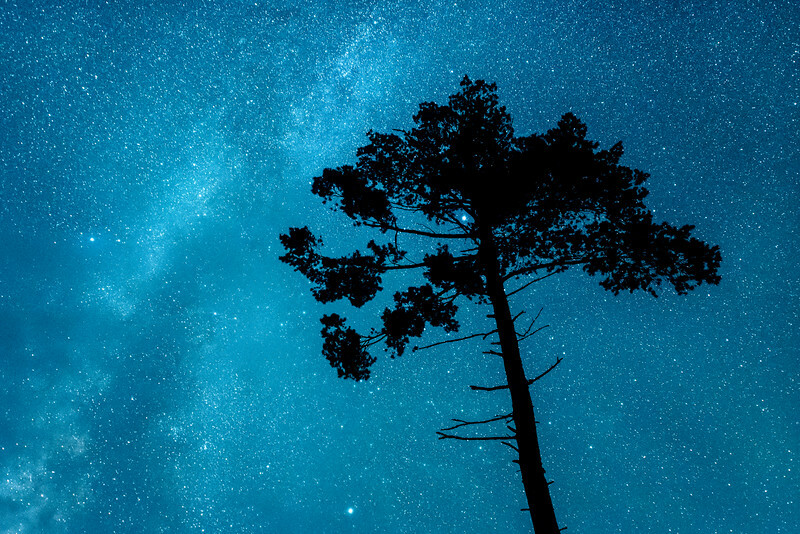 We are now approaching the new moon which means our night sky will be much darker but this also coincides with the Perseid meteor shower which occurs every year around this time. So, the night sky conditions should be good for meteor watching (that is if the clouds ever move out!). Whatever you end up doing this weekend, rest assured if you're in Grand Portage there will be plenty of activities to occupy your time! As I mentioned in my post yesterday, it is the annual Grand Portage Rendezvous Days Celebration this weekend. We have a big pow-wow that goes on all weekend and Grand Portage National Monument has their big reenactment going on as well. I don't normally visit the Spirit Tree on Rendezvous weekend but this year I have company and wanted to show the tree to them. 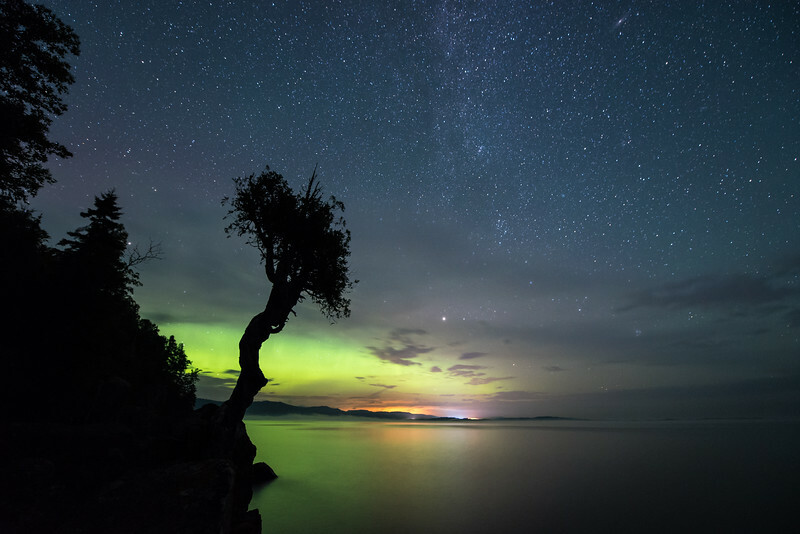 Since the space weather forecast was calling for a chance of northern lights I decided that we should visit the tree late at night to watch the crescent moon rise and wait for the northern lights to show up. There were indeed some lights, but just a soft green glow on the horizon. It was a very pretty night with the stars, clouds, northern lights, moonlight and the occasional Perseid meteor streaking across the sky. What a beautiful night last night! My friend Roger and I went out to photograph the Milky Way and at first we were hindered by too much cloud cover. After a while, though, the clouds began to move out and the Milky Way soon appeared. This is my favorite shot from last night. I really like how the clouds complement the scene. They are lit up from lights at the U.S./Canada border crossing in Grand Portage, which was just a few miles away. This is one of my favorite tree lines in all of Cook County. Love these old growth pines! They sure make for a nice foreground to the night sky. 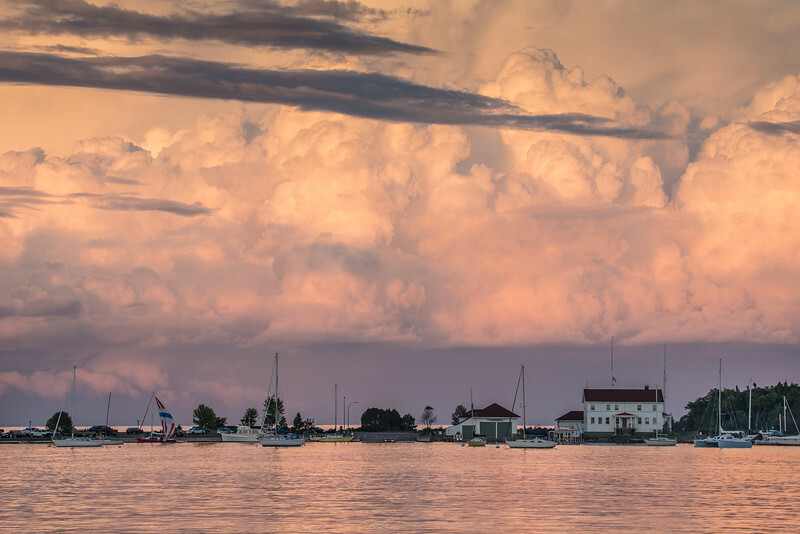 "Storm Cloud Sunset, Grand Marais Harbor"
Wow, yesterday was an amazing day for photography! For most of the day we had the most incredible thunderstorm cloud formations moving across the area. My friend Roger and I spent most of the afternoon and evening chasing the storm clouds to photograph them. Our day ended along the harbor in Grand Marais, where the last of the storm clouds was moving southeast across Lake Superior. 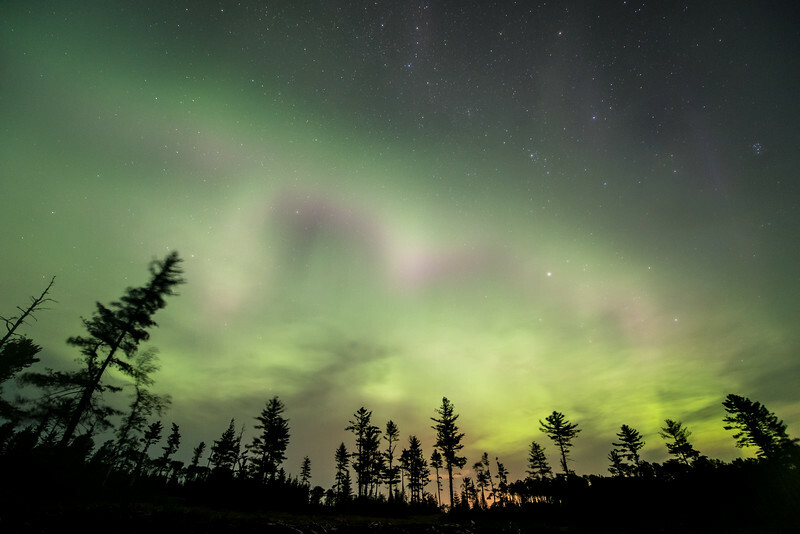 The scene was a surreal one as we drove from the Gunflint Trail down the hill and into town. The storm cloud formation was right over Artist's Point, the coast guard station and the lighthouse. Lots of people were out along the shoreline of the harbor enjoying the view of the retreating clouds. It was the perfect end to an adventurous day of photography! 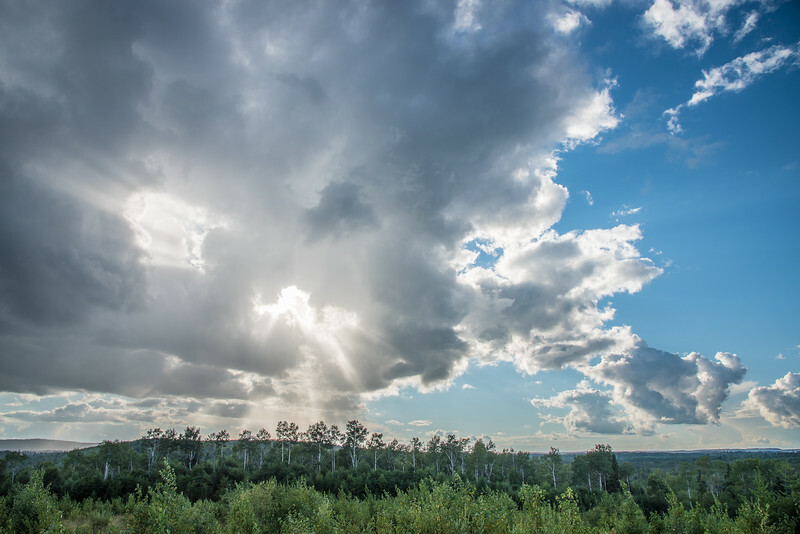 "August Thunderstorm, Grand Portage State Forest"
This was the coolest storm to watch as it passed over Grand Portage State Forest and Greenwood Lake yesterday afternoon. We could see a good rain falling beneath this structure of clouds but above us was blue sky. We were high and dry from our vantage point and had a front row seat to the storm show! Eventually there were a couple of small holes in the clouds and the sunlight was penetrating through these holes, shining rays of light down onto the ground. Just minutes after making this photo the sky shown in this photo was blue and completely devoid of any clouds. Such was the pattern of the day: brief periods of intense rain followed by sunshine and blue sky. Nature sure is amazing and beautiful! 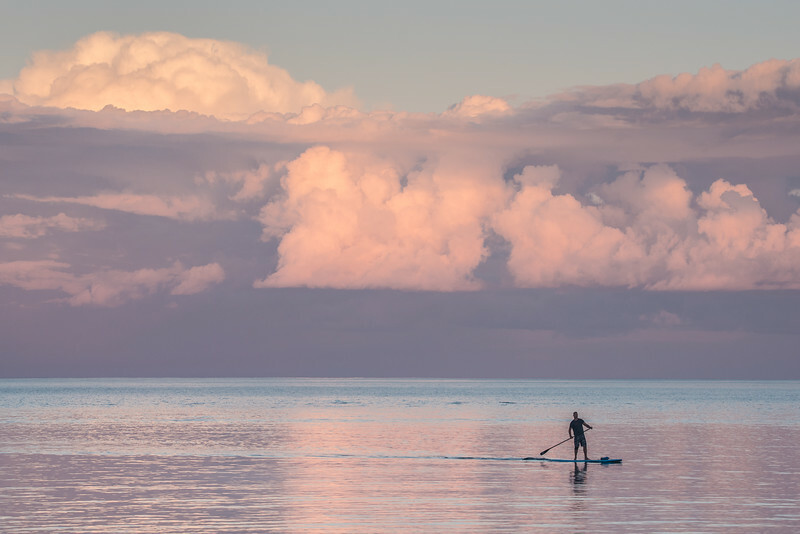 A stand-up paddleboarder paddles across the Grand Marais, Minnesota harbor entrance in front of some beautiful summer sunset clouds. I noticed he was not wearing a life jacket or any kind of wet or dry suit... definitely NOT recommended on Lake Superior! The water is very cold; I guess he figured he wasn't very far from shore so he could have made it back to shore rather easily before hypothermia set in if he had fallen off. Perhaps the little bundle on the front of the board is a life jacket? That's better than nothing, I guess, but the life jacket isn't much good if you're not wearing it. Many of the waterfalls in the Minnesota portion of the Lake Superior watershed are at a really nice level right now for photography. 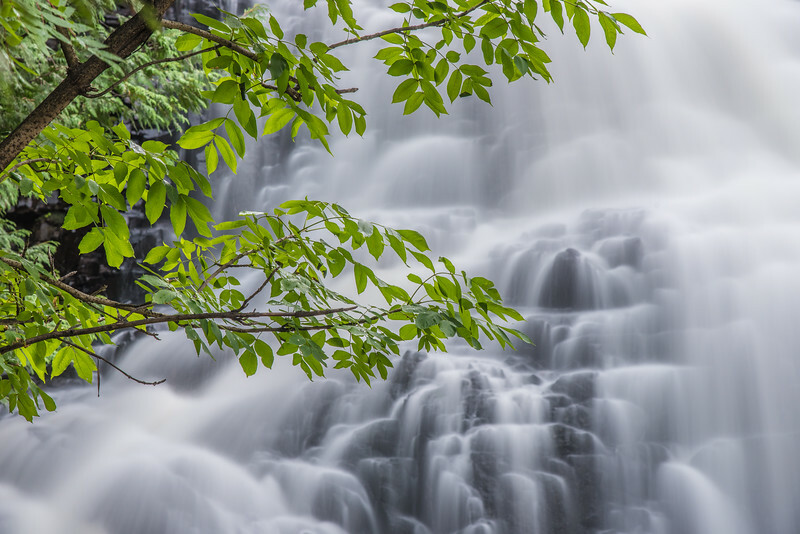 A beautiful waterfall is definitely one of the most rewarding subjects you can point your camera at. I have photographed this scene the same way during the fall color season but it's the first time I've done so when the leaves are green. It's hard to say which one I like more, the one with green leaves or the one with orange/yellow leaves. Both of them are beautiful. If you haven't done so lately, go for a hike and enjoy a waterfall. I guarantee you won't regret it! 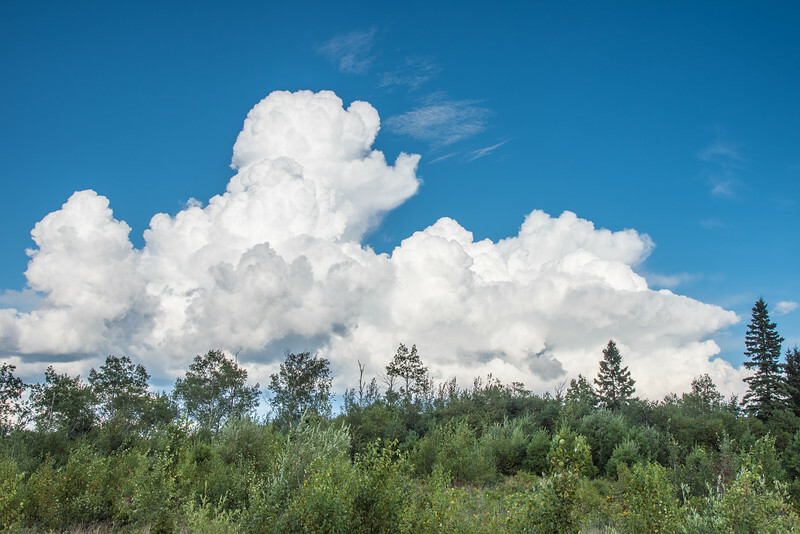 A storm cloud from earlier this week that was steadily progressing from northwest to southeast across Grand Portage State Forest in northeast Minnesota. It was a fascinating day for photography as the clouds were constantly changing and thunderstorms were coming and going. Everywhere we stopped we were staring at the sky, watching the changing shapes of the clouds. This particular cloud marched very slowly across the sky; so slowly that you could barely see it moving with the naked eye. I knew it was changing, though, so I also decided to shoot a timelapse of it. For now, enjoy this still photograph of what I found to be a most interesting cloud formation! 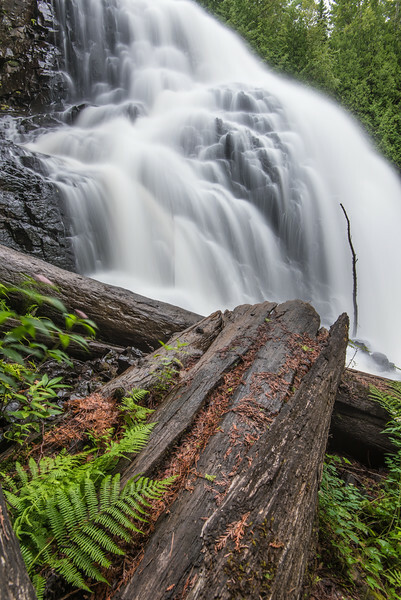 Some old-growth timber logs at the base of a waterfall in northeast Minnesota. Possibly remnants from the days when logging was running rampant along the north shore, these logs have been laying here for as long as I can remember. Perhaps they aren't from the days when most of the big timber in this area was logged, but I like to imagine that they are. It's strange too that there are two sticks stuck in the rocks at the base of the falls (one of them is really obvious, the other less so as it is kind of behind the water). I've never seen anything stuck in the rocks like that before at this waterfall. Rather interesting, I think. 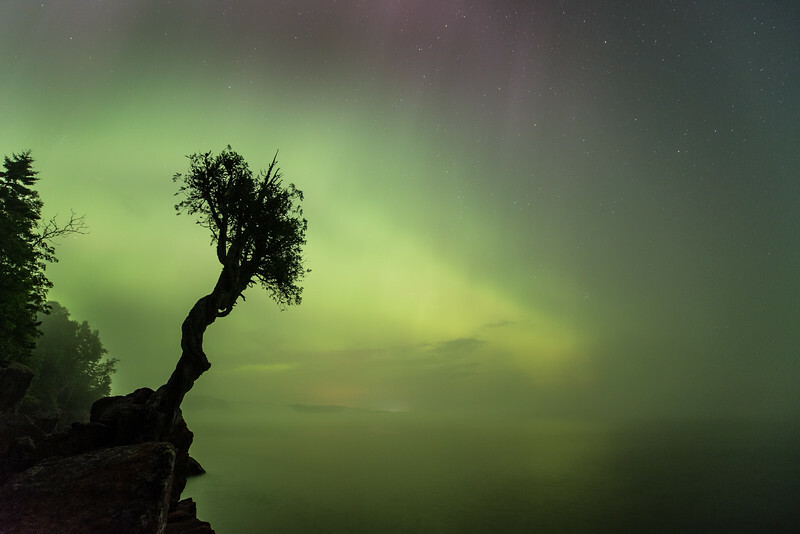 "Lake Superior Fog and the Northern Lights"
Last night was another first in photography for me: photographing the northern lights AND Lake Superior fog at the same time! While we were sitting down along the shoreline last night watching the lights dance overhead some fog moved in and filled the bay. It reduced the intensity of the lights somewhat but it also changed the quality of the light that we were seeing. It made for an interesting look in the photos. 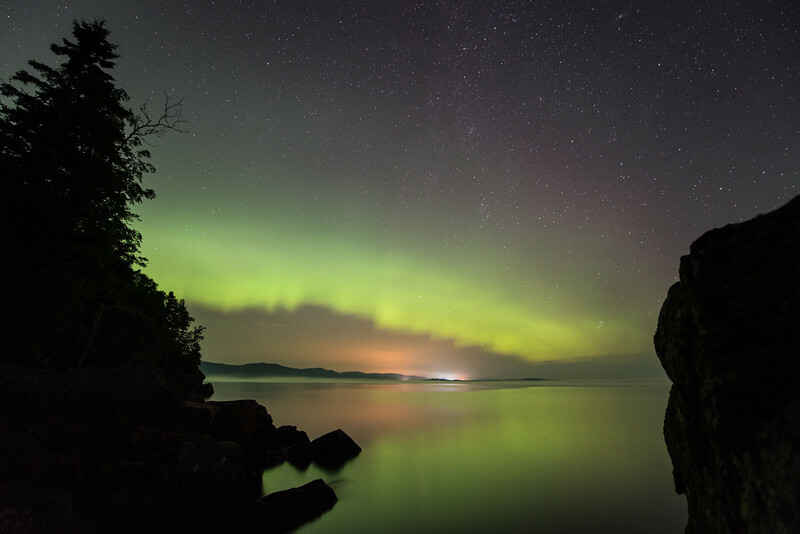 Early on in last night's aurora borealis display along the shoreline of Wauswaugoning Bay in Grand Portage, MN. For the first 45 minutes or so this glowing ribbon of aurora entertained us from the northern horizon. As midnight approached the lights did pick up in their intensity but it was nice enjoying this early soft glow as well. 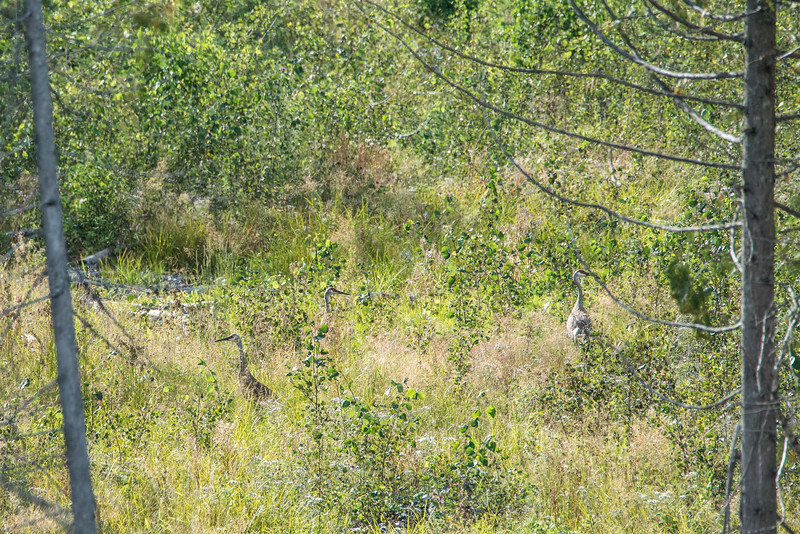 "Sandhill Cranes along Otter Lake Road"
I had a very unexpected wildlife encounter recently. 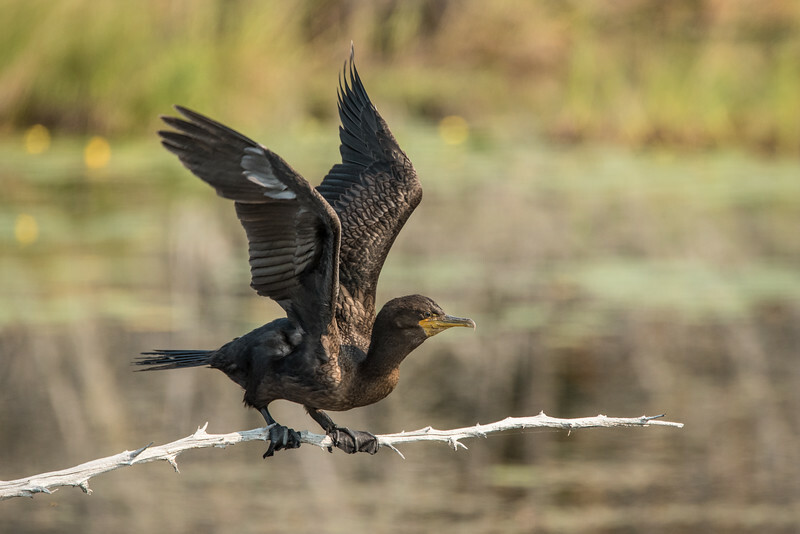 I was driving along Otter Lake Road with my friend Roger who was up for the weekend and we had been talking about spotting wildlife. He was mentioning how good I was at spotting animals and how bad he was at it. Just seconds after he said that, he said "I think there was one of those birds back there... like the ones we go to Nebraska to see". I said "What? A sandhill crane?" And he said "Yeah". So, I stopped the truck and we backed up to a logging cut that we had just passed. Sure enough, there was the head of a crane sticking up above the tall grass near the edge of the clearing. As we looked closer with our telephoto lenses we saw a second head, then a third pop up from the grass. The cranes had spotted us as well and as they often do in Nebraska, as soon as they spotted us they started walking away. They were moving towards a trail that went in between two logging cuts. We followed them slowly to try and get a better shot but they were moving too quickly and we didn't want to spook them so we took a few shots from far away and called it good. After we could no longer see them I decided to walk up into the second clearing and see if there was another chance to photograph them. By the time I made it up there, though, there was no sign of them. 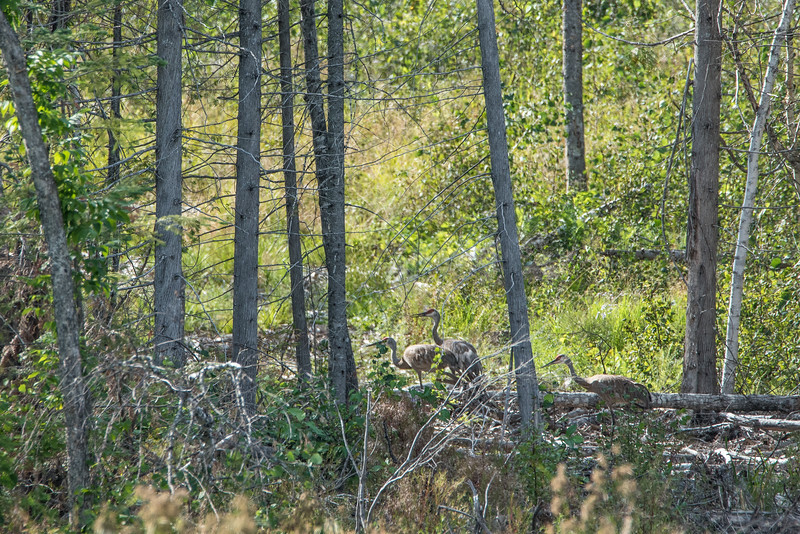 It was such an unusual encounter, I never ever thought I would see sandhill cranes foraging in a logging cut! There must have been something they wanted out there, because they were pecking at the ground as they walked along. Seeing these birds was definitely one of the highlights of our day! 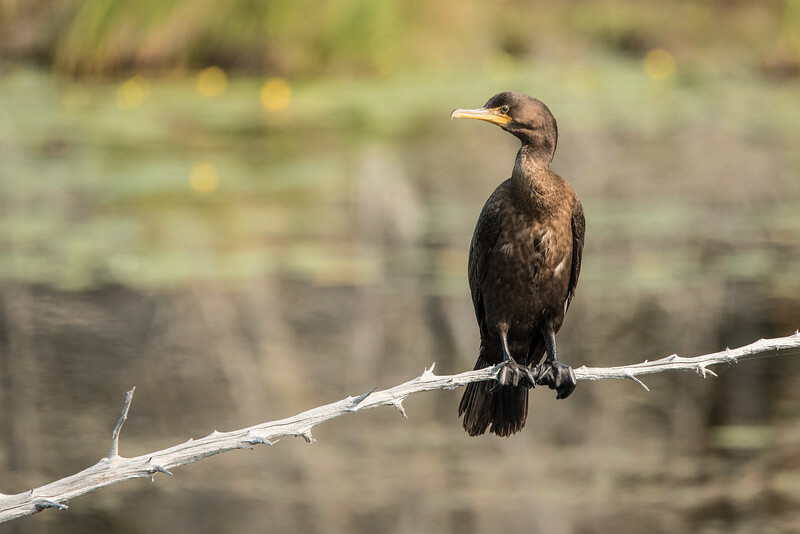 For the past week or so there has been a cormorant hanging around on the small lake (appropriately named "Little Lake") behind our house. It is the first time I've ever seen one on Little Lake. While not the prettiest of birds, I do still enjoy seeing them especially when they are in such a photogenic location. 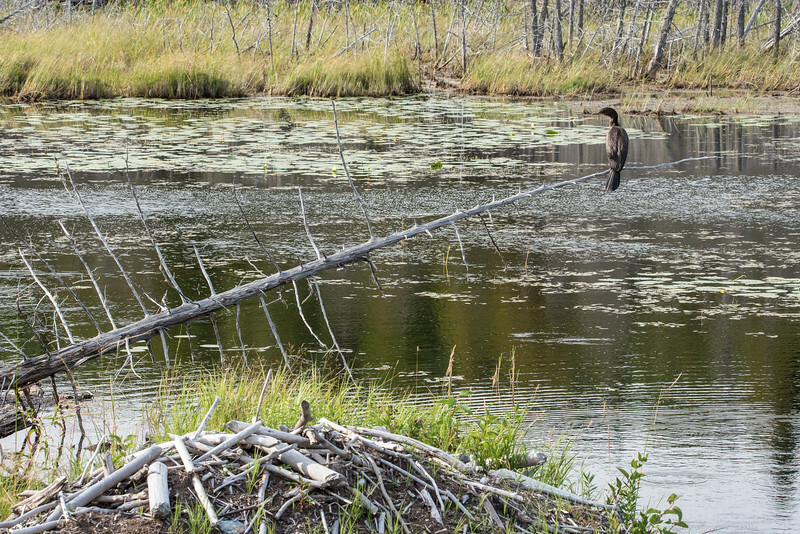 His favorite perch seems to be this tree right above the beaver lodge. I've seen him perched on other trees but most frequently on this one. We've seen him perched with his wings outstretched to dry them, which would make a great shot but we've only seen that when riding by on our bikes and the camera was left at home. Still, I've been able to get some nice shots of him including one morning when he flew from his perch after watching him for about 10 minutes. 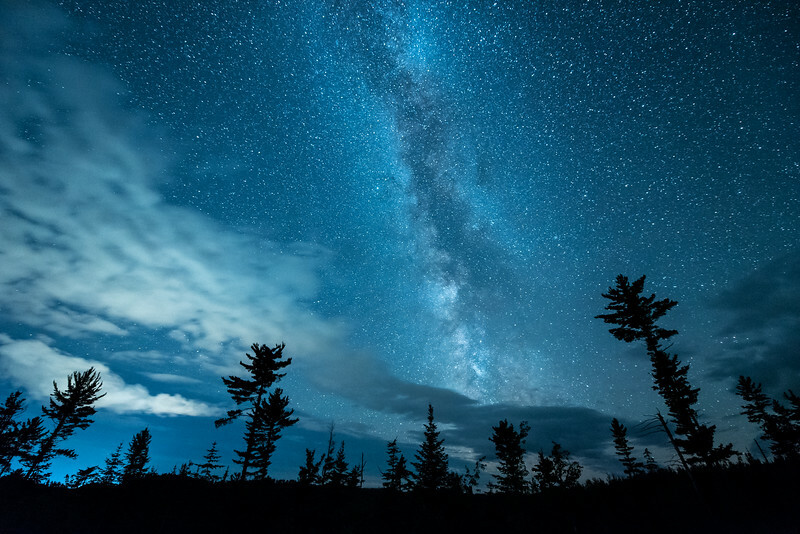 "White Pine and the Milky Way"
From a recent outing to photograph the Milky Way Galaxy. Photographed within a stand of old growth white pines in Grand Portage, MN. Nikon D750 and Nikon 14-24mm f/2.8 lens, 20 second exposure at f/2.8 and ISO 10,000. August 25, 2015 - Crazy autumn-like weather yesterday! It definitely felt like fall with temperatures in the 50's, intermittent rain sprinkles and high winds all day long. I didn't let that stop me from taking my Monday evening post-work bike ride though. Maybe I should have stayed home, because I had a mishap which totally mangled the front derailleur on my bike. I had to remove it from the bike in order to complete the ride. During the last 5 miles of the ride I was descending in elevation back towards Lake Superior and looking at these beautiful clouds out over the lake. I was hoping the entire way that they would hang on until I got home so I could get some pictures. Luckily for me, the conditions lingered long enough for me to arrive home, grab my camera gear and run half a mile down the road to grab this shot. 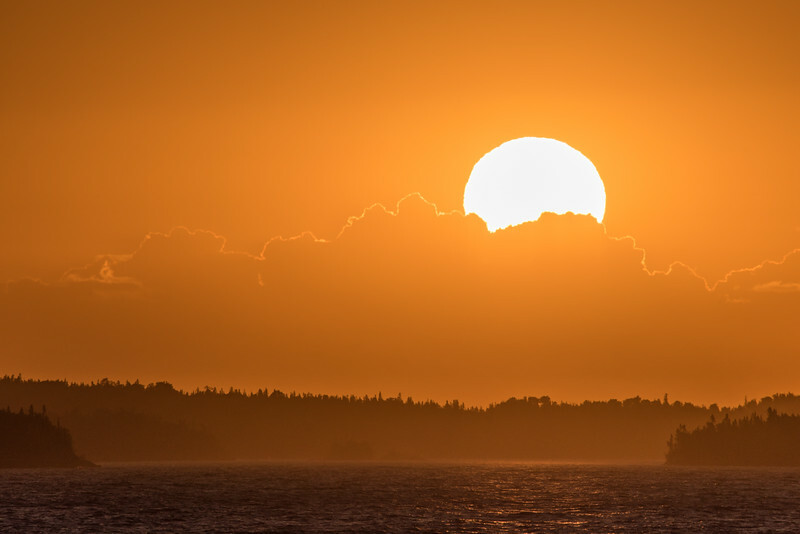 Here is another photo from last night's sunset, taken with my telephoto lens to create more of an abstract image. 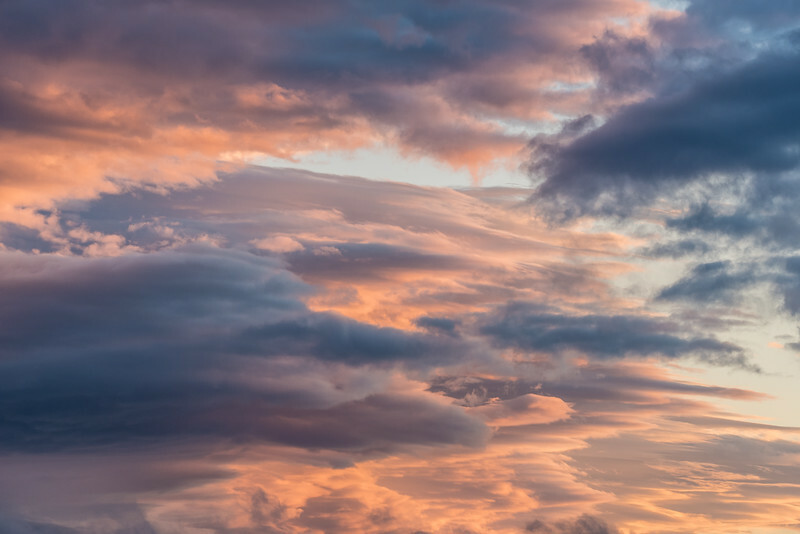 The colors and patterns in the clouds were pretty surreal. We sure do live in a beautiful world! "Hiking the Finger Point Trail"
What a beautiful day for a hike! On Wednesday of this week Jessica and I ventured just across the border to explore the other side of Pigeon Bay on Lake Superior. We hiked the Finger Point Trail, which is a little over 3 miles round-trip. 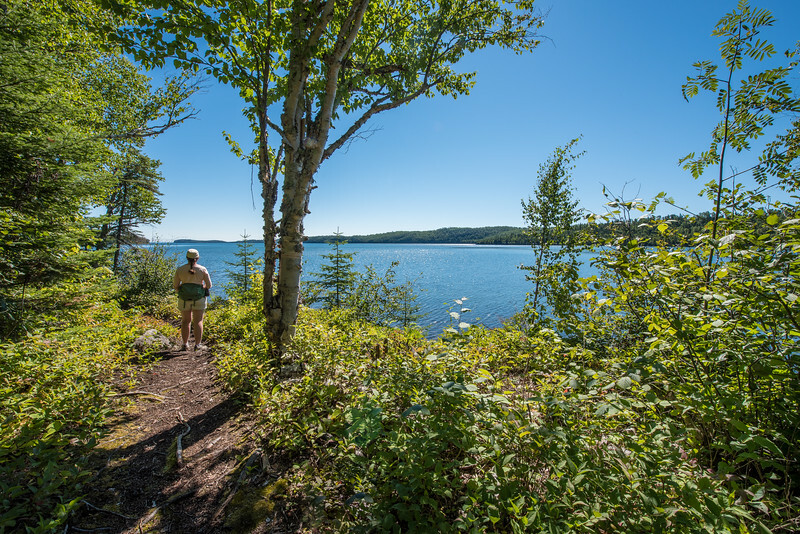 The trail follows along the shoreline of Pigeon Bay and ends on a high hilltop overlooking Lake Superior. It is a beautiful and very rewarding hike. While this trail is in Canada, the point that you see in the background of this photo is Pigeon Point, which is the very northeastern tip of Minnesota. 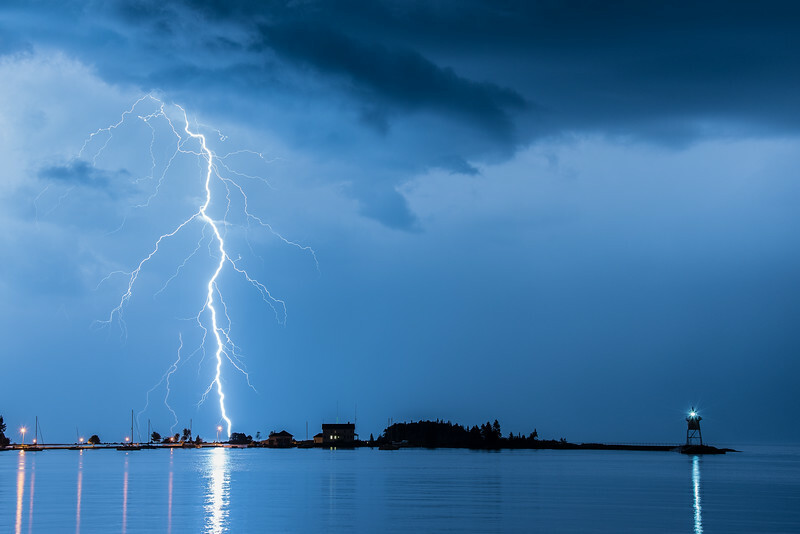 "August Thunderstorm, Grand Marais Harbor"
Last night before going to bed we were noticing some lightning flashes outside, so I looked at the weather radar and it showed a huge line of thunderstorms heading from west to east across northern Minnesota. I decided to head out and try to capture some photos of the lightning. I've been wanting to capture a lightning photograph over the Grand Marais harbor for quite some time, so that's where I decided to go. The radar showed the most intense parts of the storms were still a bit west of us, so I figured I had enough time to make the 40 minute drive before the storms passed by. Well, the weather hit a little earlier than I expected and it ended up taking an extra 10 minutes to get to Grand Marais. The lightning was spectacular all the way along the drive and I was worried I was going to miss it over the harbor. Several times I had to slow to 35 to 40 miles per hour as the rain was coming down so hard I could barely see the lines on the highway. Thankfully, when I arrived in Grand Marais the storms were still going full blast. I was able to capture a few good shots of the lightning strikes before the weather moved too far out over the lake. The one you see here is my favorite shot of the night. 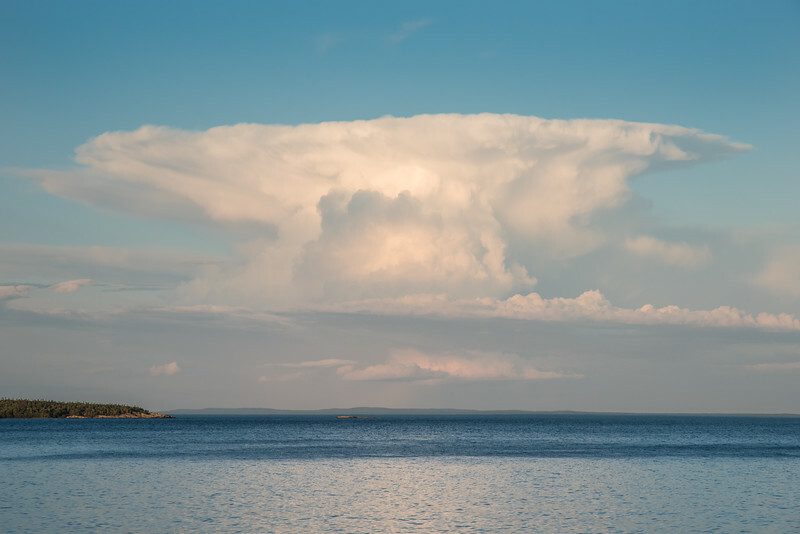 Here is another favorite from last night's series of thunderstorms over the harbor in Grand Marais, MN. 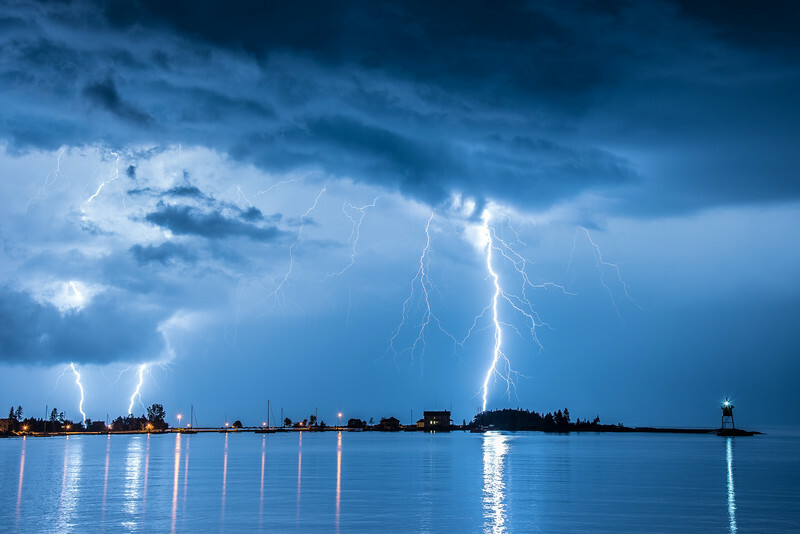 While watching the lightning storms over the Grand Marais harbor the other night, there were several quiet periods in between the storm fronts. During one of these quiet periods a fog bank rolled in over the harbor and made all kinds of unique things happen with the lights around the area. At one point I was walking around to stretch my legs a bit and looking away from the lake over the campground area when I saw this spruce tree with a street light directly behind it. 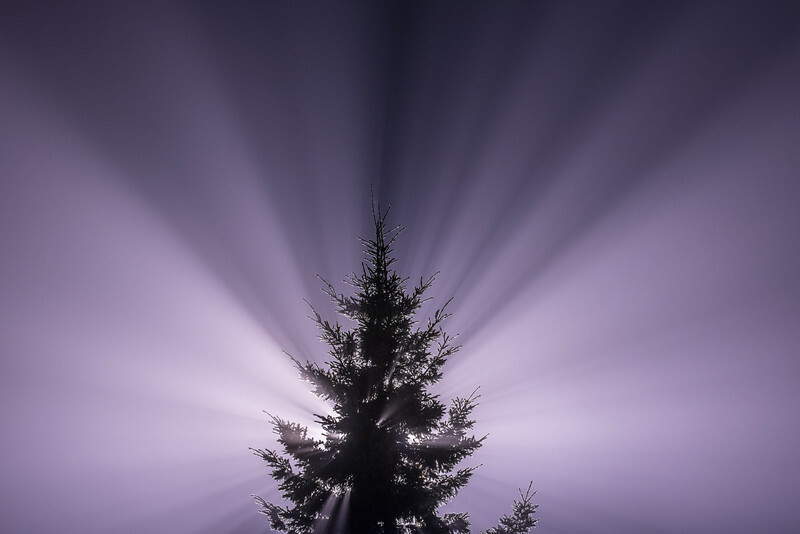 The way the light was spreading out from behind the tree and into the fog was mesmerizing.